From dawn to dusk it’s interesting to observe how the daily activity changes. Early morning is a busy time with hundreds of monks and lay Buddhist practitioners doing morning practice and prostrations in front of The Stupa. As it is a receptacle for the minds of all Buddhas of the past, present and future, it is a source of great blessing and merit. 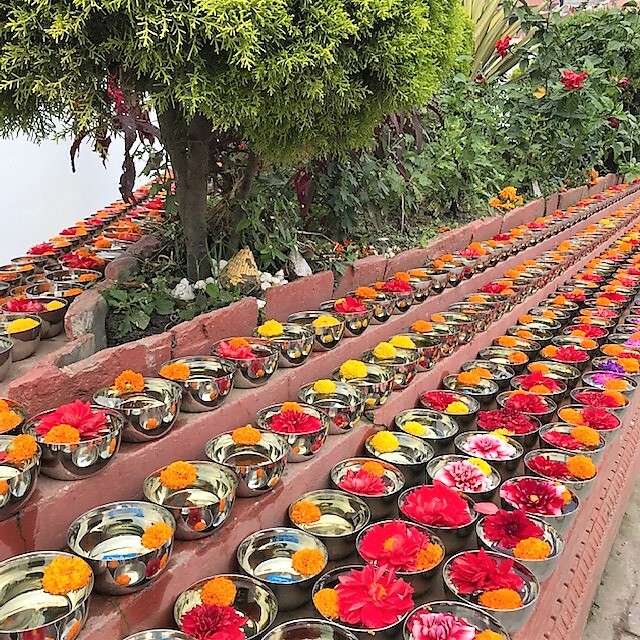 The collections of sounds of chanting of various different practices, the wings of the hundreds of pigeons as they take flight, together with the tune of the Tara mantra constantly playing from one of the shops, all seem to blend into a harmonious rhythm. Outside the Stupa many people are doing Kora and monks recite their sadhanas. 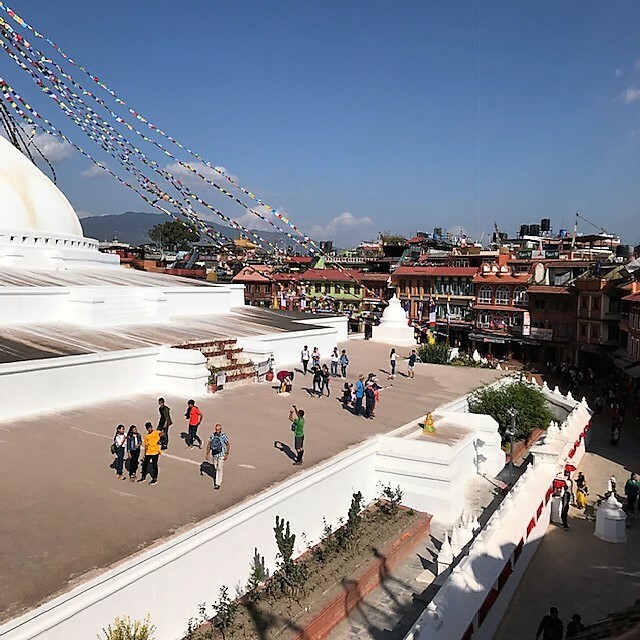 There are a huge number of Tibetan monasteries surrounding The Stupa – apparently, of the 130 monasteries in Nangchen, many are now established here in Boudanath. 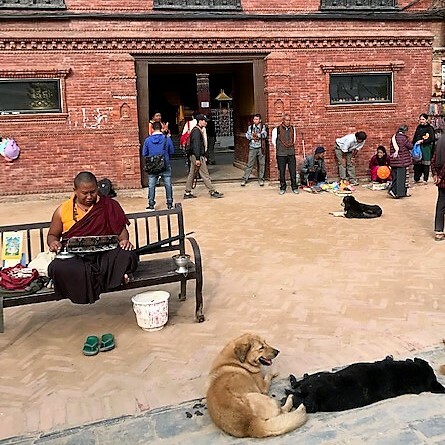 There are often dogs lying outside monasteries and it has been said that these are former monks who have broken their vows in a previous life, a good reminder of the importance of keeping any vows one may have taken! 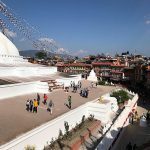 The local people take good care of the Stupa and its surroundings, sweeping the ground. 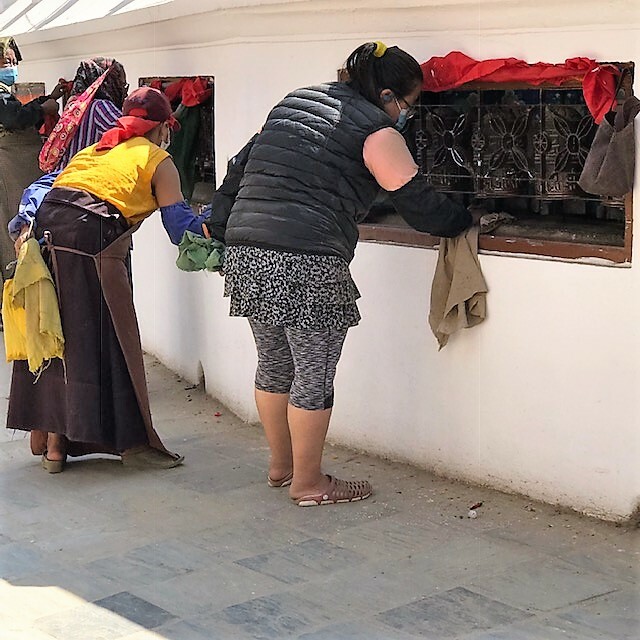 Today there were several people carefully shining the numerous brass prayer wheels that surround The Stupa. There are also many shops selling ‘ Happy Buddhist Things’ as one shop is called! 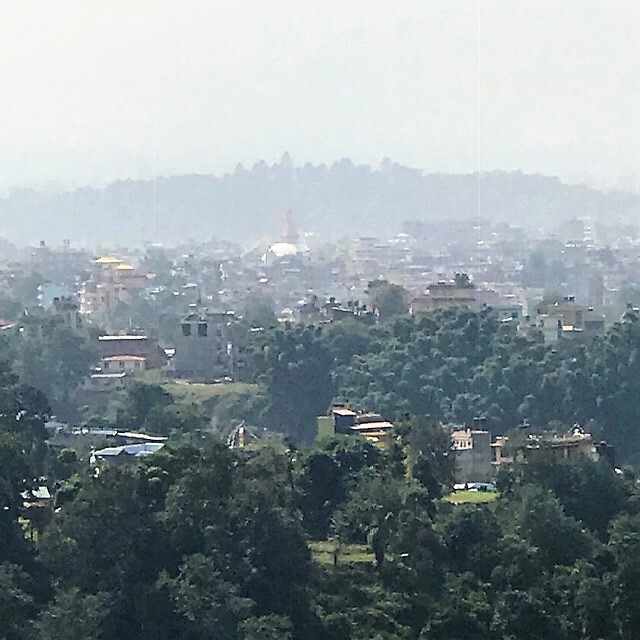 A popular place is the Himalayan Java Coffee house with great views overlooking The Stupa and good coffee as well. The temperature starts to rise from 10am onwards and after this time the crowds thin out somewhat, apart from tourists, mad dogs, Englishmen and the dedicated. Later on when the temperature drops, towards late afternoon many people are seen doing Kora as the sun sets once more over The Stupa. 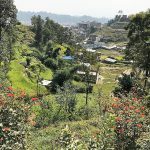 Today I decided to take a walk from Tegchen Lekshay Ling into the hills to find Pullahari, the monastery of the Great Jamgon Kongtrul Lodro Thaye. My friend Kunga’s advice was to head up the hill and then ask, which I did for most of the journey. 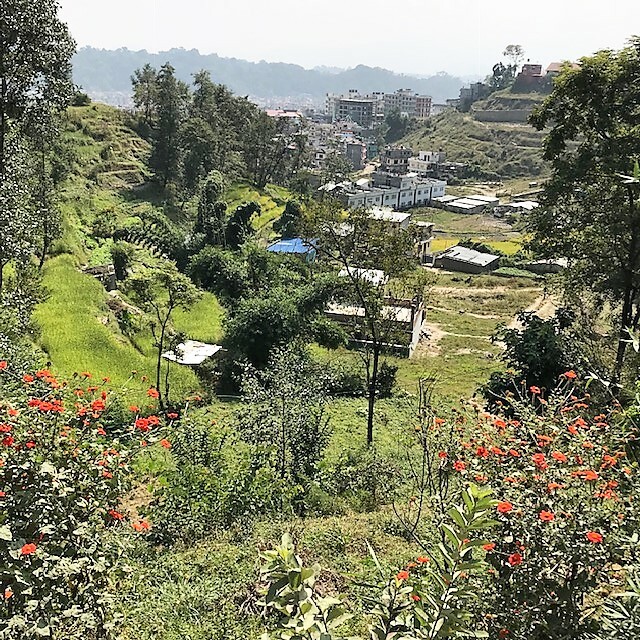 After passing various small local shops as I continued to climb I found myself in the green hills with spectacular views over the Kathmandu valley. It was good to get out of the city although the passing motorcycles still managed to kick up a lot of dust. It was hot but not excessively so and as I ascended, the chorus of crickets seemed to get louder. Finally I arrived at Pullahari, in beautiful gardens with glorious views. 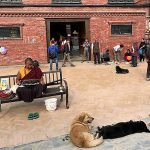 Unfortunately, both the Gompa and Stupa were closed when I arrived and the little monks who were busy running about flying kites didn’t speak any English. So I waited and after a while some older monks arrived and opened both so I could see inside. The main Gompa was large with many wall paintings and the main rupas were at the front. The other room, which was set higher up in a separate building, housed an amazing gold stupa which contained the kudung of the Third Jamgon Kongtrul. 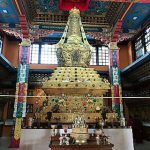 I reflected on how we have received countless teachings from Lama Jampa from this amazing Tibetan Kagyu lama who is widely regarded as a Tibetan Leonardo due to his breadth of knowledge in a number of varied subjects. It was a special place and I was glad that I was able to see it. After this I continued walking onto Kopan monastery, another famous monastery set up by Lama Zopa, but unfortunately it was closed to visitors. 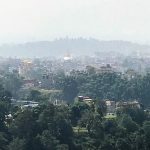 I continued walking into Kathmandu, mainly because there were no other options, but managed to get a taxi back, much to my relief! 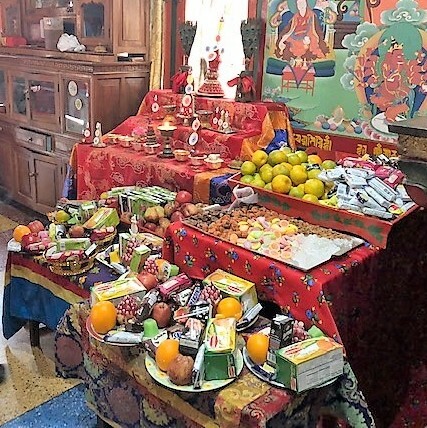 Today was the most amazing day and easily the best of my trip so far because another visitor to the nunnery, Kirsty, had arranged to sponsor a long life puja for Karma Thinley Rinpoche. Yesterday, we went to a Tibetan shop tucked away in a backstreet off the Stupa and bought khataks (scarves which are often given in the Tibetan culture with gifts or as a greeting). These were of various sizes and colours, ranging from a beautiful large yellow one for Rinpoche to white ones for the monks and nuns. We also bought envelopes so we could give money offerings. 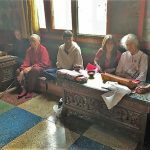 This morning the monks and nuns started an Amitayus long life puja (a devotional ritual) for Rinpoche in the nunnery’s shrine room. 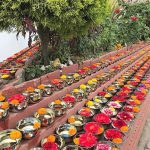 There was an amazing array of tsok (food) which had been brought as offerings, all beautifully arranged in ornamented containers. 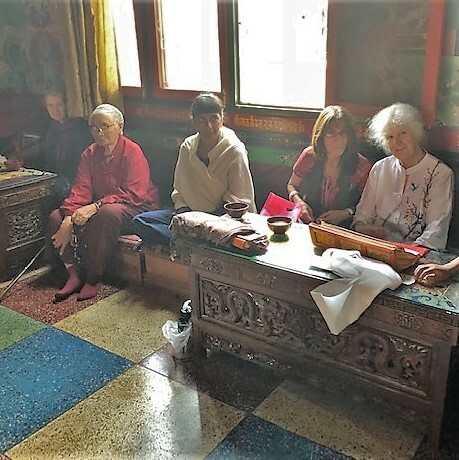 Then it was time to make our offerings to Rinpoche and we all filed up the narrow stairs to his private sitting room which is on the third floor of the nunnery. 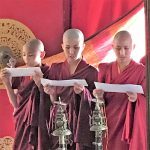 Meg and Kit from the Dechen community in Devon were there, as well as Anne, a Judge from Germany who is teaching the young nuns. Along with the monks and nuns we all entered Rinpoche’s room, where Kirsty and others were lined up to make offerings to Rinpoche. He was resplendent in his red Khenpo hat and he literally shone as Kirsty offered a filled Amitayus rupa (statue) and the others followed with the other offerings. We then all offered khataks and it felt like the blessings were flowing. It was a truly special moment and I felt very blessed to be there. Then we returned to the shrine room where we were given sweet rice and tsok to eat. 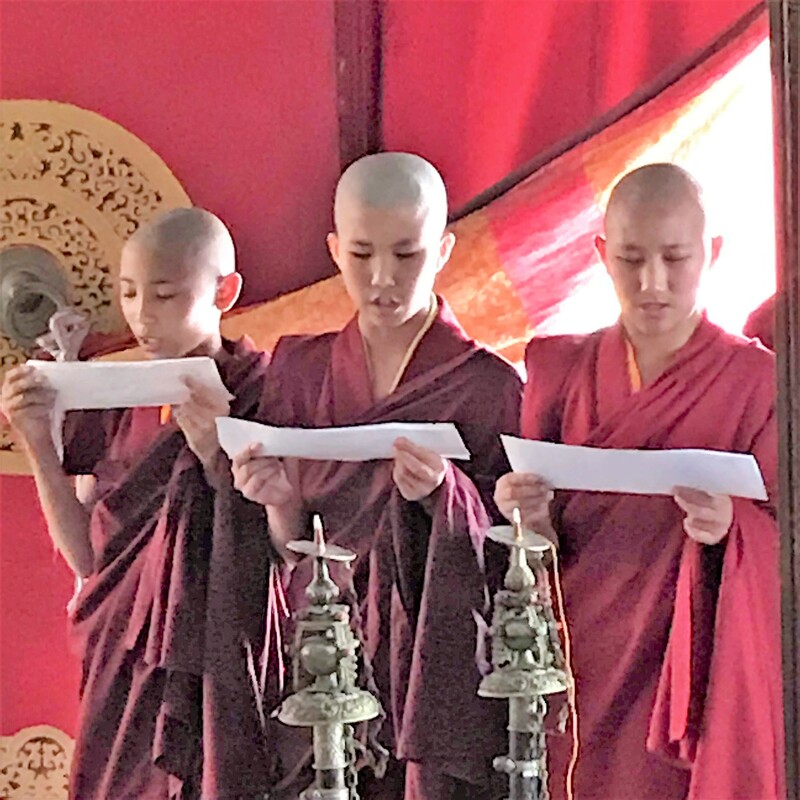 Kunga (Rinpoche’s attendant) and I went round to make offerings to the monks and nuns and some of the young nuns sang the tsok offering prayer beautifully. Then we were invited to have lunch with Rinpoche upstairs which was a lovely end to a truly special and unforgettable day.